Toni Llanos is a professional dancer, choreographer, and fitness instructor whose experience spans over two decades. She began her specialty aerobic/fitness class featuring Afro-Caribbean music in 1996. After receiving her degree in Dance Education from New York University, she added the modern techniques of Jazz and African Caribbean dance to her repertoire. She eventually became a Certified Fitness Trainer and developed an exciting African Caribbean Aerobics & Fitness class which she has taught for over 19 years. 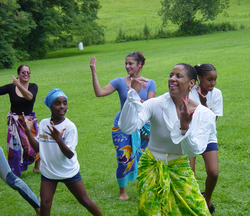 Her training, an exhilarating combination of African, Latin, and Caribbean movement has been experienced and enjoyed by hundreds of participants throughout the Hudson Valley, Brewster, Westchester, New Jersey and New York City. An Adjunct Professor of Black & African Dance Studies at SUNY New Paltz, Ms. Llanos continues to use her talents and skills to connect and communicate her passion for the art of dance and the importance of utilizing it as a means to release stress and gain a balanced lifestyle. Mrs. Llanos is the director of the M*POWER After School Dance Program offered at the Poughkeepsie Middle School. In its second year this FREE program is funded by the 21st Century Community Learning Center Grant. Students learn various dance genres, improve self confidence, build inner strength and discover their own creativity through dance. Through historical information students are able to see the connection between the past and the present. Students are encouraged to perform at local events and attend trips to theater productions. Sensei Joe Llanos is both a drummer and martial arts expert. He holds a third degree Black Belt in Goju Ryu Karate and is an official certified instructor in the international Kenshi-kai Karate-jutsu Kobo Jutsu Association, North American branch. Under Headmaster Hokama Tetsuhiro 10th Dan, Hanshi of Uehara Nishihara Okinawa. Sensei Llanos continues his training under North American Chief instructor Luis Morales Sensei 8th Dan Kyoshi grade. Through high quality martial arts instruction he empowers people of all ages to achieve their full potential. By emphasizing self-protection, health, fitness and life skills in a safe and positive environment his students are inspired to become more confident, and successful contributing members of our community. Sensei Llanos’ passion is to bring the spiritual discipline and body fitness necessary to excel in karate to people who may not have experienced rigorous physical training in the past. As part of the 21st Century Community Learning Center Grant, Sensei Llanos is in his third year providing a free Martial Arts After School Program at Krieger Elementary & Morse Elementary schools. The program's outreach has been successful in servicing 30+ students in each school. Joe Llanos also serves as audio consultant for M*POWER Productions. He incorporates years of experience as a NYC DJ to bring great energy to M*POWER’s exciting dance routines. Working closely with lead choreographer, Toni Llanos (and dancers), produces all music for every performance to bring each unique routine to life. Mr. Llanos still DJs to record-breaking crowds with David Depino at the famed Paradise Garage reunion and Larry Levan birthday parties, which are much-anticipated annual events in New York City. He has also made guest appearances with DJs Francois K, Danny Krivit, and Joe Claussell at New York’s premier Sunday night party, “Body & Soul.” For Joey Llanos and his audiences… The odyssey of dance music discovery continues. ​Julian Llanos began Martial Arts at the age of 3. Since, he has studied three different styles including Tai Kwon Do, Tang Soo Do and currently Go Ju Ryu. He has acquired his 2nd Degree Black Belt in both Tang Soo Do and Go Ju Ryu. Julian will test for his 3rd Degree in Go Ju Ryu in the Fall of 2016. He is currently the Senior Instructor for the Martial Arts Program at M*POWER - Center For Cultural Fitness, Inc. In addition to his Martial Arts back ground, he also chose to pursue training in dance. ​In 2007, Hip Hop dance was introduced at M*POWER where Julian developed an interest. As in Martial Arts, he soon demonstrated great abilities for learning choreography quickly and executing a powerful style. When M*POWER created its own dance team, M*POWER Elite, Julian became one of the team’s choreographers. His previous musical training with African Drummers, Baba Kazi Oliver & Baba Moustapha Diedhiou would serve him well as a dancer & providing musical production for the Dance Team. Through the years, he has taken many basic classes with professional choreographers in the area and some well renown artist. As a student at New York Ballet Academy he’s had the privilege of training with Mr. Steve Rooks (former Principal dancer for Martha Graham; Resident Choreographer and Associate Professor of Dance at Vassar College) & Ms. Alessia Gaetana Santoro (Faculty at NYAB & Vassar College). He has trained in Ballet, Contemporary, House, Hip-Hop, African, Jazz and Modern dance. His choreographed work has been used in performances by M*POWER, New York Academy of Ballet, Civic Center’s Figure Skating Team. One of his memorable performances was in honor of Marlon Jackson (of the Jackson 5) at the Prestige Awards Ceremony. Along with the M*POWER Elite Dance Team, he has performed at a variety of venues including: The Bardavon, UPAC, The Civic Center, Family Partnership, Coney Island, Vassar College, SUNY New Paltz, Dutchess Community College, and The Grand View. His dance training has allowed him to work with many renown artists in the industry: Cris Judd, Dave Scott, Brian Friedman, Tyce Diorio, Kelly Peters, LUAM, Laurieann Gibson, Tabitha D’Umo, Wade Robson. Currently Julian is the Senior Instructor for M*POWER’s Martial Arts & Dance Programs. His is also instructing at Krieger Elementary, Morse Elementary & Poughkeepsie Middle School for the FREE After School Karate & Dance Programs funded by the 21st Century Community Learning Center Grant, now in its 3rd year. This Fall he started his 2nd year as NYAB’s main Hip-Hop Instructor. Julian continues to improve his skills & talents by attending master classes, seminars & conventions for both Martial Arts and Dance throughout the year. Maya Llanos is currently a senior martial arts instructor & Junior Dance Instructor at M*POWER where she assists with training and choreography for the M*POWER Elite Dance Team, After School Dance Program and M*POWER's Intensive Performing Arts Summer Program. Maya has also worked with M*POWER as a Martial Arts Instructor in the Poughkeepsie City School District’s After School Youth Program. At the age of 11 Maya participated in her first adult class at Broadway Dance Center with renowned Hip Hop choreographer LUAM. Later on in 2011 she attended The PULSE On Tour Dance Convention for the first time in New York City where she received her first scholarship. Most recently while attending one of their regional conventions in Boston, Maya was invited to perform in Brian Friedman's Fashion Show, a major part of the PULSE Showcase. Maya along with other M*POWER students have attended The PULSE On Tour Regional Dance Conventions annually since 2011. 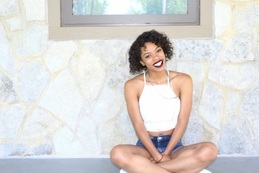 Maya & other M*POWER Dancers have earned scholarships to attend some of the Regional Dance Conventions. Maya continues to enhance her training at M*POWER and attending classes at New York Academy of Ballet (NYAB), Broadway Dance Center & a variety of dance workshops in & out of New York.